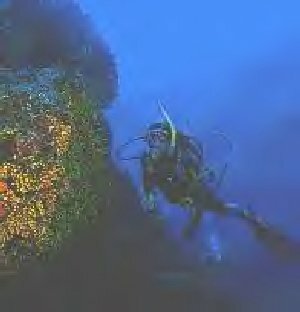 Reef, cave and wreck diving is available fromTarrafal on the north of the island with Georg form Germany, a veteran diver. He provides a Padi course for & pound;270 and offers diving training in the pool for beginners. There are a dozen sites nearby including wrecks. Fish include grouper, tuna, mackerel, and tropical reef fish but shark are rare. After the diving tragedies in the Red Sea, this is the sensible, sane alternative at a very modest price (we do not mean shark attacks). There are dives every day of the year, but the least wind is from April to November, when the water is very clear, except in plankton build-up. Visibility is up to 40m except during the September equinox. October to December are best for seeing shark in dawn dives. Seward from King Fisher Lodge. Ideal for beginners. At the edge of Tarrafal bay, a long wall descends to a maximum of 18m, perfect for photos. You'll see Frog Fish, slugs, octopus and crabs. 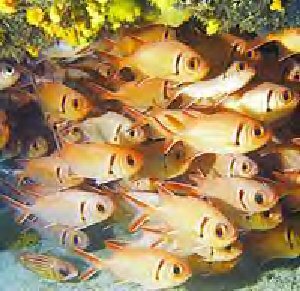 A gradual sloping seabed with several overhangs, is home to shoals of West African tang and trumpet fish. There is a cave full of yellow coral. It is a very easy cave dive. Bearded brotula and spiny lobster live there. Maximum depth is 25m. The beach at Ponta Atum also takes you to a dive beyond the overhangs to an isolated rock. with a large fish propulation from shoals of sardine, tuna and horse mackerel. Maximum Depth of about 35m. This beach slopes down to reefs at around 25 meters, with a gentle current. File fish, different kinds of moray eels, porcupine fish, trigger and trumpet fish swim here. This offers three different dives. It has overhangs, walls, shafts and passages, with a 1-2 kt current, this is for experienced divers only, but is rich in marine life with tuna and horse mackerel. Maximum dive depth is 40m. A beautiful arch at 9m, heralds a sharp drop in the ocean floor with West African tang and trumpet fish. with bristle worm on the bottom. The wall which drops to 25 metres, is inhabited by crabs, prawn, slugs, moray eel grouper, comber and West African tang. At the bottom are small tunnels. 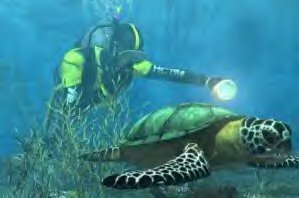 it is ideal for night dives. Beyond L`Arc with many shoals of fish and horse mackerel, with larger rocks and greater depths down to about 35 metres maximum. It is ideal for photos. The long wall continues with nooks and crannies, but with lesser overhangs. Many fish dart in and out of the cover to a depth of 35 meters maximum. This reef, with many crevices and crannies allows you to dive through the rocks. Octopus inhabit some of the narrow nooks experienced and occasionally a stingray hides in a larger one. Depth to 20m. A shore dive, where the bottom drops sharply to 40m. Beautiful deep walls with shoals of West African tang, file fish, sardine and horse mackerel. This is a day trip from Tarrafal for experienced divers, as there are strong currents over rocks on entering. A long drive south the Cidade Velha so this is a day trip and a shore dive. You can salso visit the original fort with a fine view over the ocean and lunch at the beach barbecue. (Anchors from the ships, perhaps sunk by Sir Francis Drake or lost from Portuguese trading ships litter the bottom - there must be at least 50. Depth of 20m..
A two hour trip from Tarrafal and a ride in a fishing boat takes you to an area where sharks congregate. There are sharp reefs plunging down 100m and inhabited by many types of tropical fish. Another 40 minutes by boat is a site with manta rays. Both are for experts and involve a day trip. "At present it isn't possible to dive the older wrecks, but in the capital, Praia, you can see a great exhibition of items brought up from 400-year-old ships during an archaeological survey. Included are large lumps of fused "pieces of eight", and a gold crucifix with diamonds and emeralds still intact. Much more treasure lies down there, waiting for the government to allow marine archaeologists to recover it."